Before Paris and Nicole, before Britney and Lindsey, there was the Brat Pack. The Brat Pack was a group of young actors from the '80's including, Demi Moore, Rob Lowe, Judd Nelson, Ally Sheedy, Charlie Sheen and Emilio Estevez. All of whom except for Sheen appeared in the movie "St. Elmo's Fire". This truly vapid waste of celluloid depicted the lives of six college friends as they started to make their ways in the real world. All suffer the tediously predictable problems that come from having to become an adult. Think of the movie as "Friends" without the laughs, haircuts or $5000/month Manhattan apartment. Like Par-Nic-Brit-Lin, the Brat Pack's personal lives were tabloid fodder. Estevez's initially perhaps the most interesting, he was engaged to Demi Moore and in 1992 married Paula Abdul (Yep Idol's own Paula, I would love to have seen that gift registry). In 1984 Estevez would play Otto in the cult classic film, "Repo Man". One of the scenes in "Repo Man" is when a group of street punks rob a convenience store. As the robbery goes bad, one of the thugs lies dying in a pile of cans labeled "Food". No description of what's inside, just black and white labels proclaiming "Food". Food was boring. Food was generic. Food that wasn't fast seemed excessively complex, fussy and even exotic. Gourmets ate the parts of animals most people threw away (pate, sweetbreads) or ate weird things like sushi, risotto or duck. Thankfully, as people got wealthier and the world got more "globalized" (huh? ), people started to get more adventurous with eating. Today crablings we're making duck legs. I don't want any whining or squeamishness. A duck is nothing but a chicken with a better publicist. This recipe appeared in the Sunday New York Times Magazine (1/27/08). It is ludicrously easy, so no excuses. Ideally you'd make this meal in a dutch oven, like the Le Creuset I pimped in an earlier post, but a big, oven-safe pot will do the job. 1. Preheat the oven to 250 degrees F (120 C). Season the duck with salt and pepper. Place the dutch oven pot over medium-high heat, and add the oil. When hot, add the duck, skin side down, and cook until golden brown (approx 2 minutes, but take a peek and make sure they don't need a little more time). Transfer to a plate. 2. Turn the heat to medium-low, add the onions and a little salt and cook covered, stirring occasionally, until they are softened, about 15 minutes. Stir in the lime zest and serrano chili (or pepper flakes). Add the red wine, ½ cup of water and a pinch of salt. 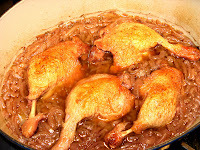 Nestle the duck legs, skin side up, on top of the onions. 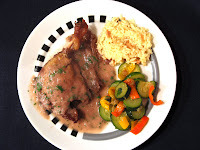 Bring to a boil, and then cover, place in the oven and cook until the duck is tender but still toothsome, about 1 1/2 to 2 hours. 3. Transfer the duck and 1/2 cup of the onions to a plate; cover to keep warm. Purée the remaining onions, the cooking liquid and lime juice in a blender (or if you have one, use a stick blender and puree right in the pot). Adjust to taste with salt and lime juice. Stir in half of the cilantro. 4. Mound the reserved onions in the centers of 4 plates. 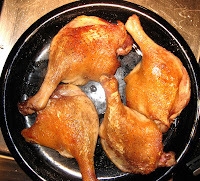 Put a duck leg on top of each, and pour the sauce around the duck. Sprinkle the remaining cilantro over each plate. Serve as a hearty appetizer. Serves 4 (as an appetizer or small dinner, add additional legs if you're serving bigger appetites for dinner). Adapted from “Aroma,” by Mandy Aftel and Daniel Patterson. Cleaning Up: Measly. One cutting board, a grater, a knife and the pot. Tip 1: Peel off the duck skin before eating. It's soggy and doesn't add much to the meal. Tip 2: Serve with rice pilaf or mashed potatoes (roasted garlic mashed would be best, you'll get that recipe another day). Tip 3: Serve a Pinot Noir with dinner. WW Bob recommends: Mark West or Castle Rock from California at less than $15 each; A to Z or Erath from Oregon at $15 to $20; or a Jadot French Red Burgundy at about $40 for you big spenders. Alright, I know I promised a WW Bob story for this post but that's going to have to wait. Post your questions and comments. Until then, just remember, you can do it, you can cook. P.S. Don't rent "Repo Man", it's crap.